Learning can be a very rewarding and successful process for all children if approached in a wholistic manner. Children must have a solid foundation not only in basic educational principals, but also in focusing techniques, health and nutrition, self-trust and empowerment. Meditation techniques teach students to draw upon their own inner focus and apply it to outer tasks when learning, while reducing stress and supporting self esteem. Utilizing yoga poses while learning teaches students to stave off boredom, endure difficult learning challenges, alleviate stress, and integrate fun physical activity. Research shows a strong connection between the gut and emotions; nutrition is key to support learning and minimize difficulties caused by food related sensitivities. Emotional stress when coupled with learning difficulties can be overwhelming and debilitating. Uncovering core false beliefs is a key element to successful learning. An educational therapist is a specialist who has undergone unique training in specialized techniques designed to remediate learning disabilities, improve processing, and teach compensatory skills. They train students to learn how to learn. Working from formal and informal assessments, an educational therapist is able to tailor individual learning programs aligned with a student’s key strengths and areas of challenge, as well as provide case management for clients with learning differences. Educational therapy demystifies learning and stimulates a student’s awareness of their unique abilities so they are able to confidently approach any subject with the proper tools to be successful. 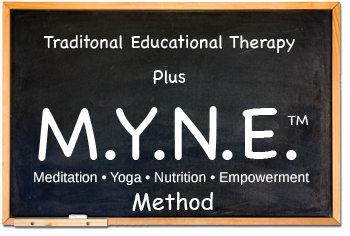 Click here to learn more about how we integrate wholistic tools with traditional educational therapy using the MYNE Method.